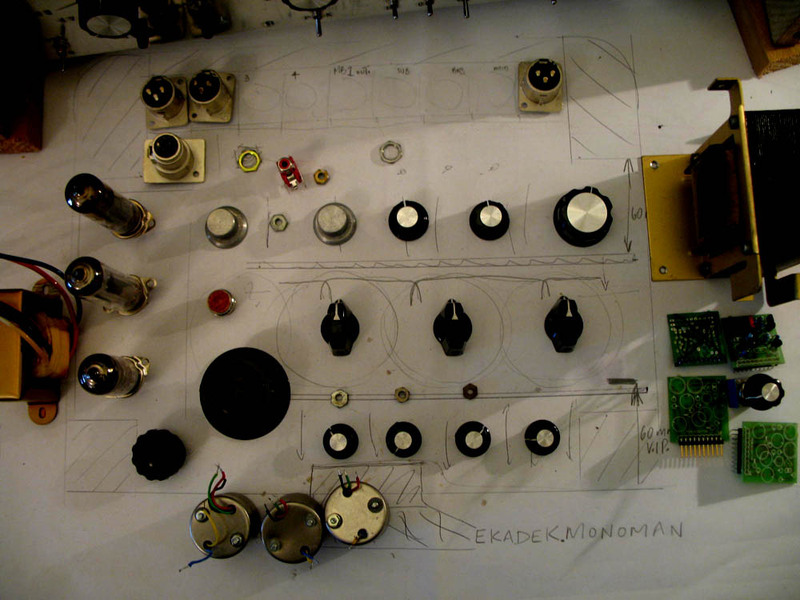 the ekadek MONOMAN is a mono tube transistor multi crossed over split P.A control unit-anator. as you can tell we dont quite knowly sure what to call it . the input stage is an MB1 two valve amplifier with volume, gain, and an output attenuation/loading circuit . it feeds 4 isolated distribution amplifier level controlled output stages. one of those then feeds a four way four output sweeping cross over frequency balancing amplifier. so as to fine tune the main central 4 way stack of the sound system. sub.bass.mid.top . the other distributed outputs feed the other amplifiers and speakers strapped all together. a big gangbanging strapped up solid P.A machine. and all this happens at the speed of light. the monoman control unit will be housed in a old tape recorder vinyl-led plywood skin and even has its own 2 watt valve phones/spka monitor amplifier. just for those days when the 2000 watt stack of speakers is looking too big for the boot. the cunning stunt of the job is fitting it in the box. 2 valve amps/3 tubes. associated transformers. 8 output amps. 16 filter amps. all transistor. 8 pole 5 position switches. 3 line transformers for phase reversal options. all those xlrs. all that shiny sexiness with black knobs and a fat fat tubed transistor sound.